People living behind levees on floodplains may not be as immune to flood damage as they think, according to results of a new study. U.S. floodplains are lined by more than 100,000 miles of levees, many of which are in questionable states of repair. UC Davis reports that the study, published in the journal Environmental Science & Policy, estimated long-term flood risk, probabilities of levee failure, and resulting economic losses in the Sny Island levee district along the Mississippi River in Illinois and Missouri. “Levee protection does prevent flood damages locally, but it needs to be examined very carefully, structure-by-structure, and quantified for all people and economic activities affected by that protection,” said lead author Nicholas Pinter, a professor of earth and planetary sciences at UC Davis. The scientists modeled four flood conditions — 2-year, 5-year, 100-year, and 400-year flood levels — with and without levees. Levee failures were also modeled. The study included floodplain land excluded from flood hazard maps because it is behind levees accredited by the Federal Emergency Management Agency (FEMA). The researchers noted that excluding such lands underestimates the actual flood risk nationwide. Because levees raise flood levels in surrounding locations, they are known to export flood risk from one set of floodplain residents to their neighbors. For example, the study models documented up to eight feet of additional water imposed on the town of Hannibal, Missouri, due to the Sny Island levee. This counterintuitive “negative benefit” of levees — meaning the actual increase in risk to some residents behind levees — is on top of the export of flood risk to a levee district’s neighbors, and other levee impacts. UC Davis notes that U.S. floodplains are lined by more than 100,000 miles of levees, many of which are in questionable states of repair. The prevalence of levees across U.S. floodplains should be viewed as opportunity, the researchers said. “The positive thing is that levees are so extensive in the U.S., that there are widespread opportunities for rebalancing flood risk and, at the same time, improving river and floodplain ecosystems,” Pinter said. 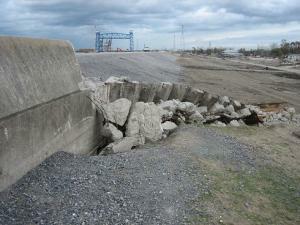 Levees are a useful and necessary part of our flood management portfolio. But not every new levee or enlargement of a levee is a good project. We’ve suggested a three-part sniff test: Levees are an appropriate solution when they protect infrastructure—people, buildings—that is 1) concentrated, 2) of high value, and 3) pre-existing. Natomas was a field-of-dreams levee, and most flood researchers and floodplain managers would point to that as a mistake. You don’t take largely undeveloped floodplain, build a big wall and then build billions of dollars of new infrastructure behind it. The beneficiaries of such projects are the developers and the local tax base, but residents, the state, and U.S. taxpayers are left with a Pandora’s Box of residual risk and liability. We’re saying, do careful analysis, assess all the benefits and the costs, including to the environment, and pick the optimum solution.